The earth is crowded, I’m tired of all these moanings, take me away, baby. Let them have the world, we’ll create our own. My trip to France is getting closer, yay! A minha viagem a França aproxima-se, yay! se é, é um dos meus filme favoritos. ai estou apaixonada pelo outfit. O verniz amarelo fica o máximo. Experimentei um e achei muito agressivo mas o teu fica muito giro. Wow, this post is amazing!! I absolutely love your glasses and the galaxy print on your shirt! i am really into yellow these days. the shirt is nice - but the univers is a well-known stylemotive. i say: wear more yellow! Adorei o look, está de génio. Para dizer a verdade quando mostraste a camisola fiquei a pensar que era muito dificil arranjar algo a combinar, mas está perfeito. uff!!! amazing!! love the top very much!! I dont know what I prefer: your top or your sandals! GREAT! wow! love the top and the sandals!! Magnifica a tua tunica!!! As tuas SANDALIAS sao ESPETACULARES!! Ja estas mais moreninha, estas uma DELICIA!!!! F..K people!!!!!! Adorei o look e o esmalte! este look está beyond amazing! thanks for the lovely comment ! Oh yeah! That's what I'm talking about ! Love the attitude ! Love your whole look, love the posting title :) and the nails are amazing! Olá Nádia! Estas sandálias são lindas! Outfit perfeito para uma festa tribal mega-exclusiva na Lua!Já me ocorreu imensas vezes ir a uma festa dessas, é pena que ainda não seja possível! I love the top, you look gorgeous! mesmo , ficam com orgulho de nos por assim ? I LOVE those shoes and that top! I want it! Adoro o top galaxy, é lindo! Great look. I love your sandals. Awesome look dear! i love your top, so cool and inspiring! Hope you had a great day dear! Amazing shirt, i love it! 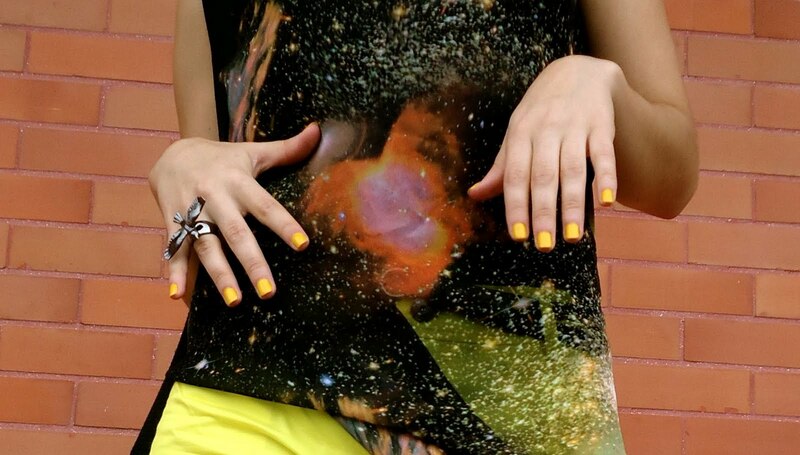 your style is great from the galaxy top to the bright nails & shorts to the sandals on your feet! muy bueno! gostei muito da entrevista.. ah, e já votei! I'm sure someone above me has already said this. But that top, is out of this world. Love this look. Unique and Inspiring. Olá Nádia! Grande look. O top além de original é giríssimo e adorei a cor dos calções. Um outif bem giro e inesperado. Via tua entrevista e adorei. Quanto à ajuda, já votei e comentei! Awesome shirt - the print is stellar! Gosto mesmo muito do look! have a fun and safe trip to france!!! so jealous!!! LOVE the sandals!!!! Fabulous outfit!!!!! That is so beautiful! I love the stars in the sky! This look is AMAZING! Love the yellow shorts and super props for the yellow nail lacquer... I've done it on my fingers but it is hard to pull off on toenails. You look FANTASTIC! Lovely pictures. The pattern on your top is gorgeous and your sandals are so cute! Amazing outfit, really colorful yet dark... love it! Thank you so much for your sweet comment, personally I don't really like my freckles (there's just too much of 'em! a little less would have been nicer!) but I always get compliments about it so I guess it actually is a good thing. I really like your blog, your style is exactly what I'm looking for these days: high-waisted shorts, knitted crop tops and wayfarers. So simple, chic and fashionable. 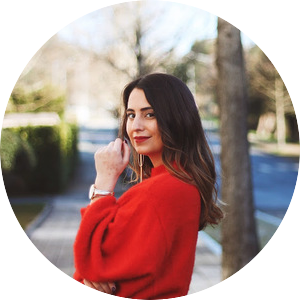 Will you my blog followen? Esse top é perfeito, gostei bastante como o conjugas-te as peças!!! I'm slightly in love with that galaxy print top and those sandals!